Many call her a miracle baby. 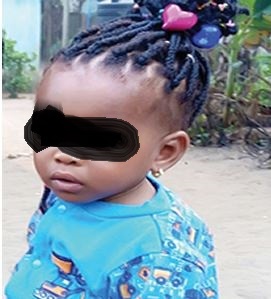 If not true, what else can be used to describe seven-month-old Chinwendu Ekiri, who was abducted from her parents’ home in Rivers State by a neighhour and found after 114 days later. Chinwendu’s parents, Emeka and Rejoice Ekiri, alleged that their daughter was abducted by Innocent Ndubuisi, their neighbour. According to them, after abducting the girl, Ndubuisi vanished into thin air, plunging mother and father into unimaginable agony. Emeka said that only God knew what Chinwendu had gone through in the hands of those, who abducted and repeatedly sold her four months ago. Emeka said: “My daughter was sold and resold for different prices ranging from, N450,000, N600,000 and N850,000. According to New Telegraph, the case of my missing daughter was reported to the Department of State Service (DSS) after several efforts of the Nigeria Police to find her, failed.” Emeka further said: “According to the DSS operatives, Ndubuisi, who stole her, contacted one Shadrach. Emeka said that when Esther was arrested at Elele, in Port Harcourt, she too had also sold Chinwendu to another woman in Ogoja, Cross Rivers State for N850,000. Emeka enthused: “The most important thing is that my daughter is back and unharmed.